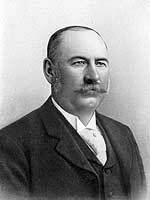 He was born in Fermanagh County, Ireland on 4 July 1843, son of John Bryans and Prudence Domey, the family emigrated to Canada in 1847 and settled at Lindsay, Ontario. He remained on the family farm until the age of 25 when he took over an adjoining farm that his father had purchased for him. He sold the farm in 1880 and moved to Manitoba, arriving at Emerson in April 1881. Here he purchased a 480-acre farm which he operated until 1907, when he retired to Morden. In 1867, he married Mary Wilson of South Victoria, Ontario. They had nine children: Margaret Bryans (wife of H. J. Carey), Prudence Victoria Bryans (wife of R. G. Argue), John Bryans, Anne Bryans (wife of William Washington), James Wilson Bryans, Robert Bryans, Mary Jane Bryans (wife of E. A. Wilson), Christina Bryans, and Esther May Bryans. He was a member of AF & AM, and the Loyal Orange Legion. He died in the RM of North Cypress on 4 June 1907. Death registration for J. Bryans, Manitoba Vital Statistics.